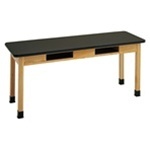 Diversified’s ChemGuard Science Table resists most chemicals, so it’s a good choice for your middle school classroom. Keep your measurements accurate by leveling the table with the adjustable glides. Steel corner braces at the legs keep this lab workstation sturdy, and rubber leg boots protect the solid oak from spilled chemicals.